I have been wanting to spend more time in the Lord's word and have decided to start following a monthly scripture writing plan. 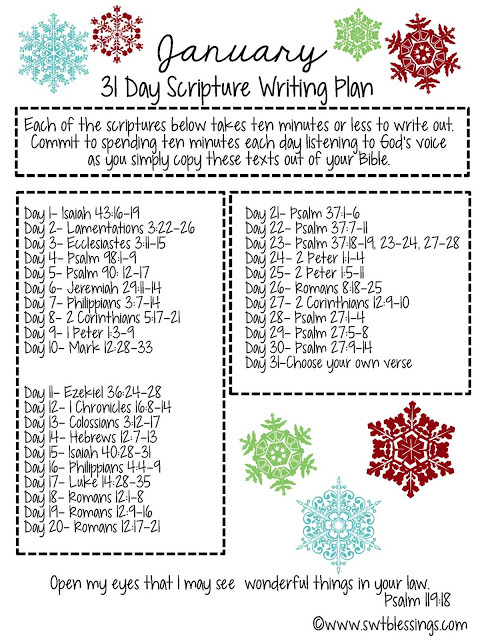 I will be sharing the monthly scripture writing plan with all of you so if you would like to join me feel free! This months plan is from SwtBlessings.com. You can also visit the author's Etsy store for some delightful prayer cards to print out. I saw this one too late. I am looking at the one for February. Thanks.